Does it get any sweeter than Strawberry Dream Squares? 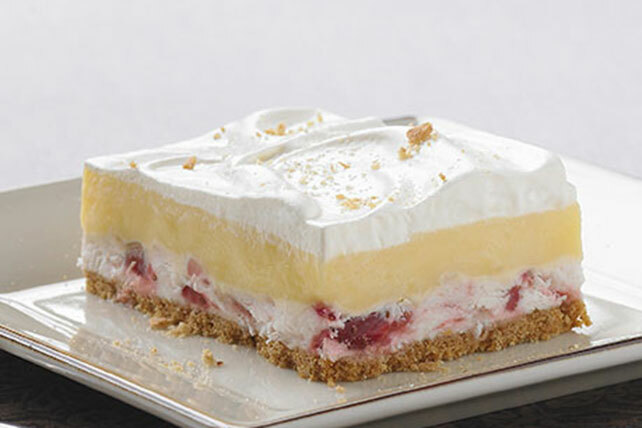 Strawberry Dream Squares have creamy vanilla pudding over a strawberry layer and graham cracker crust. Combine graham crumbs and butter. Reserve 2 Tbsp. crumb mixture; press remaining crumb mixture onto bottom of 13x9-inch pan. Refrigerate until ready to use. Mix cream cheese and sugar in medium bowl until blended. Add strawberries; mix well. Gently stir in 2 cups COOL WHIP; spread over crust. Beat pudding mixes and milk with whisk 2 min. ; pour over cream cheese layer. Refrigerate 1 hour. Top with remaining COOL WHIP and reserved crumb mixture. Refrigerate 4 hours. One serving of this Strawberry Dream Square makes a nice dessert for a warm summer night. Substitute 1 cup mashed fresh blueberries or raspberries, or 1 cup drained canned crushed pineapple, for the strawberries. Top dessert with a layer of sliced bananas just before cutting to serve.